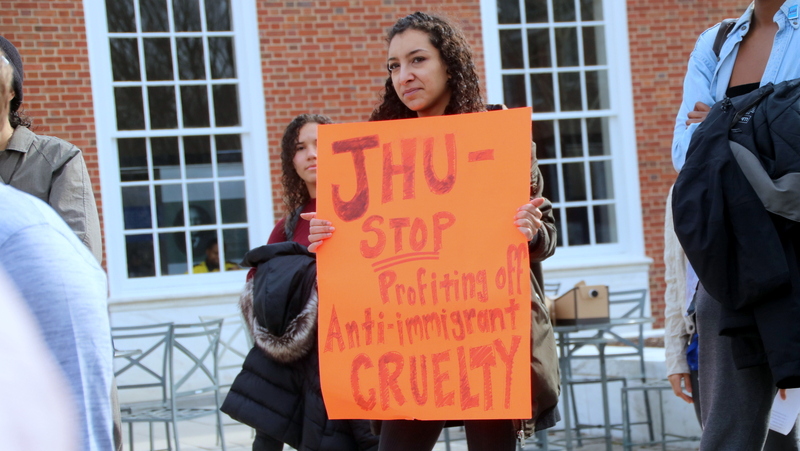 Heaping scorn on Johns Hopkins University for refusing to cut ties with ICE, the federal Immigration and Customs Enforcement agency, students and affiliates held a protest at the Homewood campus today that drew about 275 participants. “I cannot ignore this institution as it wanders ever farther into a moral abyss,” said Drew Daniel, an associate professor of English, addressing the crowd gathered outside the Milton S. Eisenhower Library. Hopkins currently has $1.7 million in contracts with the agency in two areas – at the medical school for educational programs that provide emergency medical training and at the graduate school of education to provide leadership training. Since 2008, the university has reaped more than $7 million from multiple contracts with ICE, officials confirm. That relationship has come under increasing criticism since last summer, with protesters saying the school should not support an agency that has engaged in human rights abuses. “We know that ICE terrorizes black and brown communities. ICE violates the human rights of the people it detains. It separates children from their families. People are being sexually assaulted in ICE detention camps, and children are dying of preventable diseases due to neglect,” said Daniel. “And it comes as no comfort to the people who are mourning those lost to these indignities that the people who delivered them to those camps were trained in CPR and life-saving skills at one of the finest universities in the country,” said Daniel, who created a petition signed by more than 2,000 people calling for Hopkins to sever its ties with ICE. 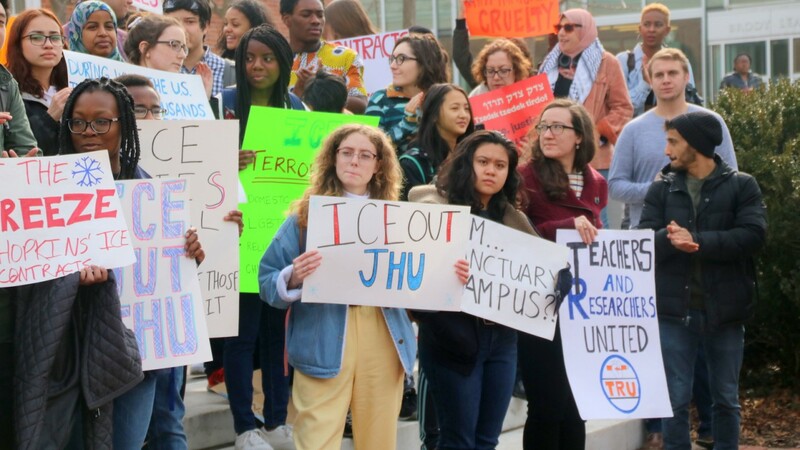 But Hopkins officials are unbending, maintaining the position they took last fall when students held two campus protests over the ICE contracts. The school’s “specialized training and leadership programs” with the Department of Homeland Security’s ICE agency “have no relationship to the enforcement of immigration policies by the current or any other administration,” spokeswoman Karen Lancaster said in a statement released to the media. Lancaster said Hopkins “has been unequivocal” in its statements concerning the consequences of Trump Administration immigration policies and reaffirms its commitment to support its international and DACA students. But the university believes its programs with ICE “serve the public interest by providing quality education and emergency medical training that ultimately benefit those who interact with the agency,” she said. 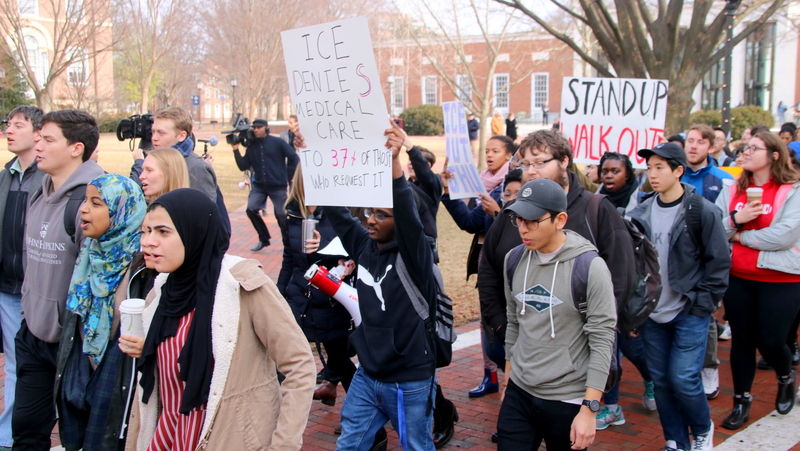 Hopkins is one of several U.S. colleges and universities whose sizeable contracts with ICE have drawn criticism since media reports have disclosed abuses at ICE facilities. The others are the University of Maryland, Northeastern University, University of Alabama at Birmingham, Virginia Tech and the Vermont State Colleges System. At Hopkins, the criticism has been particularly stinging towards University President Ronald J. Daniels, who released a highly personal letter condemning the Trump Administration immigration ban in 2017. Students said that stance has shaken their faith that, for foreign-born students threatened by federal immigration policies, the campus would serve as a sanctuary. 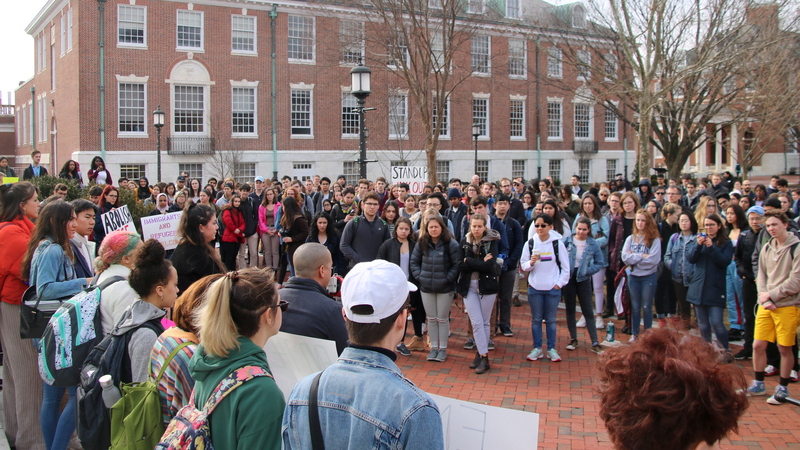 “It sends a message to our own students and employees that’we’re not going to stand by and defend you,” said Samantha Agarwal, a fourth-year graduate student and walkout organizer. As today’s protest streamed in a line through the campus into classroom buildings and past students eating lunch and working at laptops, students chanted and carried signs, several of that referenced disturbing coverage of ICE in the news. One of these was a recent report in the Washington Post in which ICE officials confirmed they have been force-feeding detainees on a hunger strike at an El Paso detention center. “Force-feeding is not medical excellence,” one man’s sign read, jabbing at the reputation Hopkins cherishes of its hospital as one of America’s premier medical institutions. “ICE denies medical care to 37% of those who request it,” another sign read. The demonstrators picked up the theme in chants, as well as signs.